Who could forget Jump Force and its epic cinematic story trailer unveiled during E3 2018? The Dragon Ball Z, Naruto, One Piece, and Death Note Universes are great, but combining them into one massive fighting game makes them even better. Now we get to enjoy even more crossover goodness with the game’s latest trailer highlighting Bleach characters, specifically Ichigo, Rukia, and Aizen. The question that may weigh on fans’ minds is which series will be revealed next? All of this increases the hype surrounding this PlayStation 4, PC, and Xbox One release. 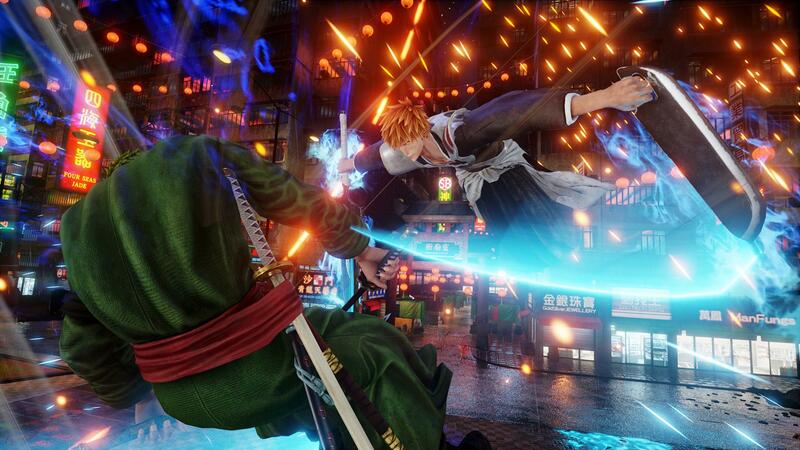 Developed by Spike Chunsoft and published by Bandai Namco, Jump Force is a third-person brawler that many are already comparing J-Stars Victory VS, in terms of both aesthetics and gameplay. The setting of this game is bound to offer a unique experience, because while the characters are from different anime series, the setting is real-life earth. Everything has a more realistic coat of paint on it. This could be off-putting to some, but refreshing to others. It’s too early to tell whether or not Jump Force will be a competent fighter, but it’s clear that the main appeal comes from how entertaining it is to see all these worlds combine. For more insights, be sure to read our full preview. Jump Force will come to the PlayStation 4, Xbox One, and PC in 2019.